The kids were happy when I said that we were having pie for dinner! They weren't quite so thrilled however when they found out that black beans were in the pie. Hahaha. 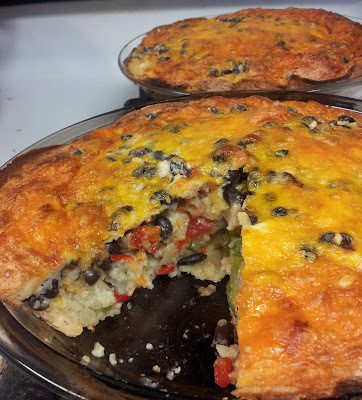 We made 2 fajita pies. 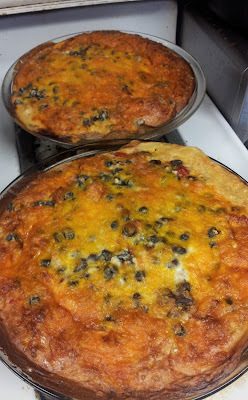 One with whole wheat tortilla crust and one with corn tortillas to make it gluten free for me. The whole wheat crust got a little crispier. Corn tortillas tend to much a little when you put things on them and bake them. I am used to it, so I don't mind. After my husband had eaten like 3 pieces he asked, "Was there meat in there?" He didn't even notice the lack of meat. Ha, I think my way of cooking is growing on him. 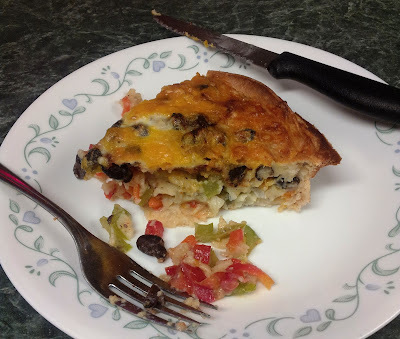 I loved this fajita pie and ended up eating way too much of it. I'd love to eat pie more often for dinner. Begin by lining the bottom of a lightly-greased 9-inch pie plate with your tortilla(s). 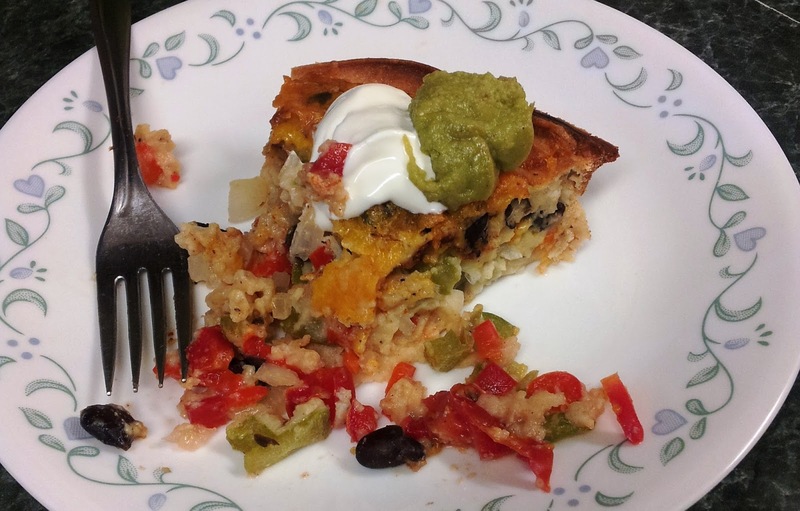 If you have smaller sized tortillas, just use 2-3, torn in half to fill the bottom of the pie plate and slightly up the sides. Finely chop 1 medium bell pepper (colored), 1/2 medium green bell pepper, and 1 medium tomato. Toss with 1 T minced onion and some pepper. Add in 2 oz of cheddar cheese, shredded. Stir well. Spread the mixture on the bottom of the tortilla-covered pie plate. Arrange black beans over the top. Sprinkle with paprika and chili powder. In the same bowl, mix together 3/4 C white whole wheat flour with 1 tsp. baking powder. Stir well. Then, add in 1 C milk and 2 eggs. Whisk well until blended. Add salt and pepper, a few dashes of each. Add in finely chopped spinach. Carefully pour the milk mixture over the veggies in the pie plate. Top with remaining 2 oz of cheddar cheese, shredded. Bake at 450 for 25-27 minutes until center is set and cheese is browned. 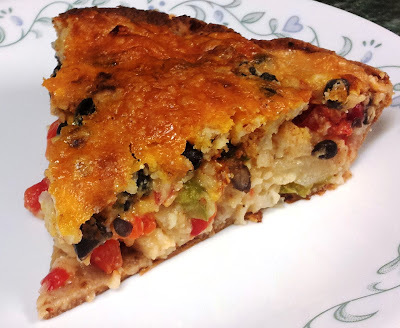 Allow the tortilla pie to sit for 5 minutes before serving.